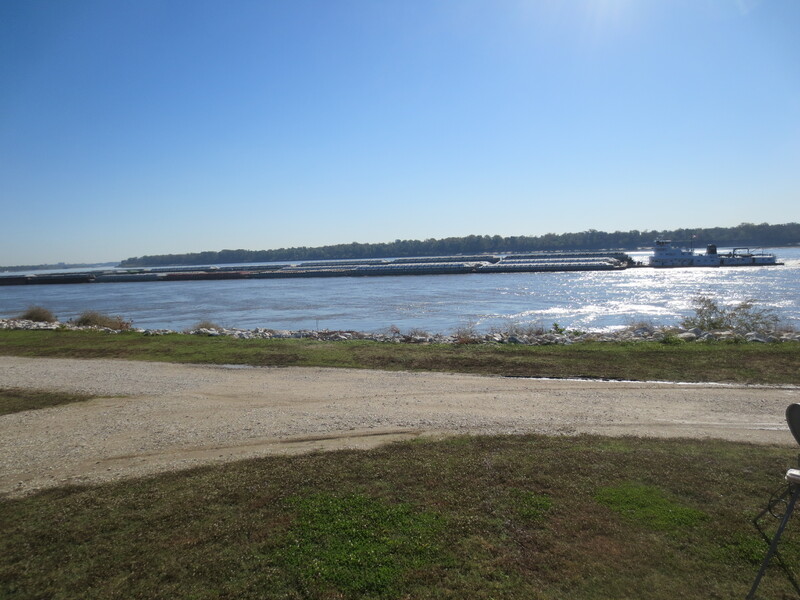 Oct. 29th arrived at West Memphis RV park – right on the Mississippi and what a great view of the barges going back and forth. Those little guys work their hearts out pushing the loaded multiple barges. 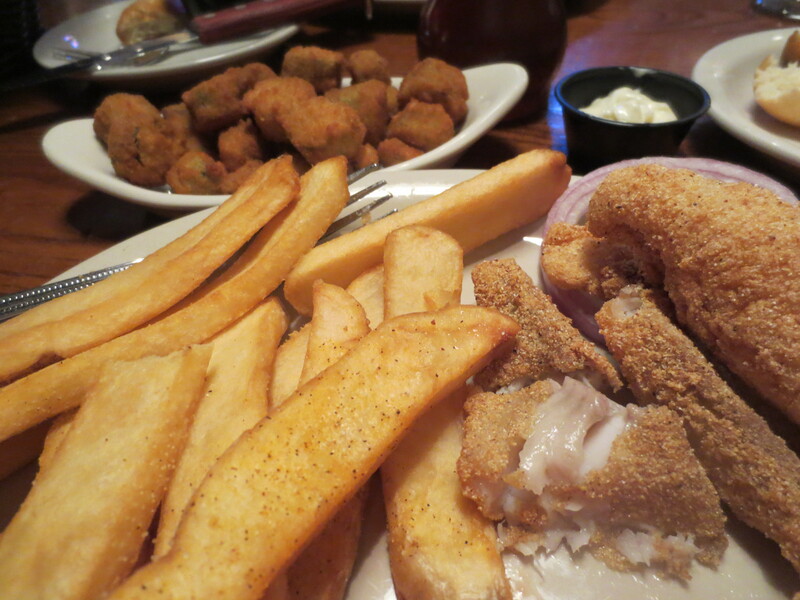 Restaurant leftovers were wonderful – catfish, fries and okra. Combine all and toss with your favorite slaw ingredients. I’m cooking a Memphis, TN dish, BBQ Spaghetti. This dish was created by Brady Vincent who ran a BBQ joint in the 50s and wanted something different to offer his customers to make his place stand out. 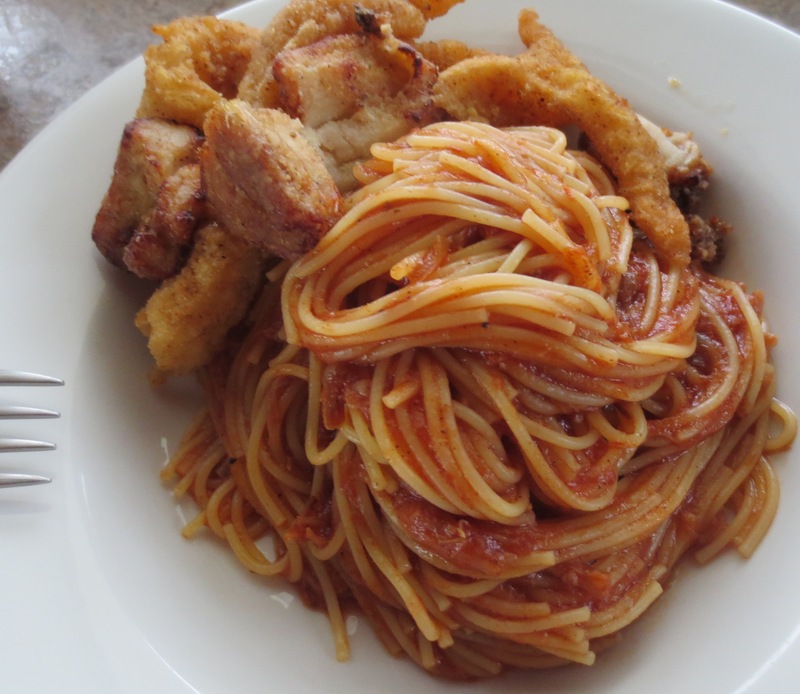 He developed the Spaghetti to compete with the normal beans that were offered with BBQ. It worked. The dish didn’t really take off until the 80s and now it is a classic Memphis offering. And, it is now a classic in our house! 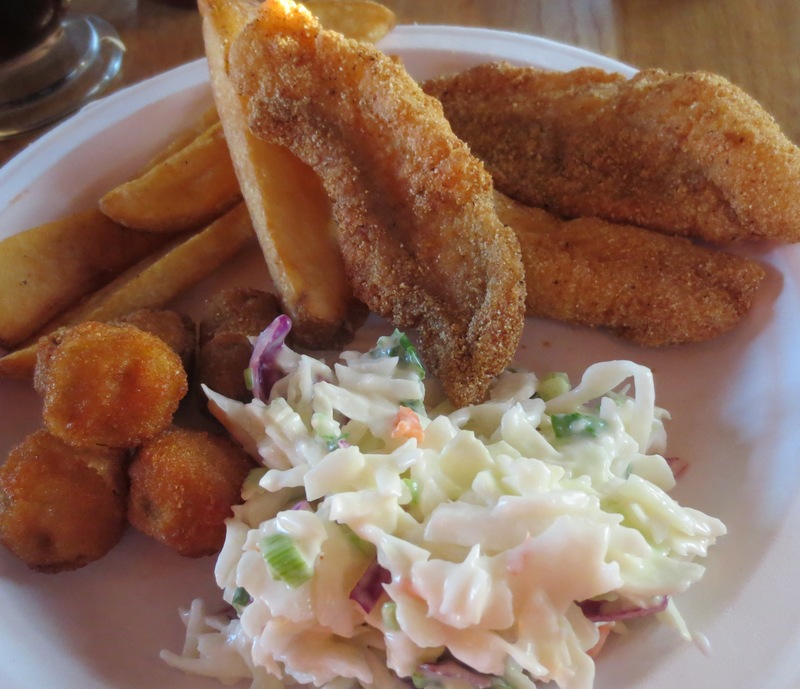 I had a little portion of fried alligator and catfish in the freezer, so added them to the dish – yes, so good!! Kind of a fusion dinner – made a green salad with bleu cheese dressing and the coolness of the salad went so well with the heat and spiciness of the spaghetti – think heat of buffalo wings + bleu cheese dipping sauce. A great match. This Memphis-style side dish is a perfect way of utilizing leftover pulled pork. This recipe is adapted from one which first appeared in the June/July 2011 BBQ issue. Saveur, 3/25/13. In a 4-qt. saucepan, bring tomato sauce, syrup, vinegar, allspice, cinnamon, cayenne, cloves, and salt and pepper to a boil over medium-high heat. Cook, stirring, until thickened, about 10 minutes. Add pulled pork; cook until heated through. 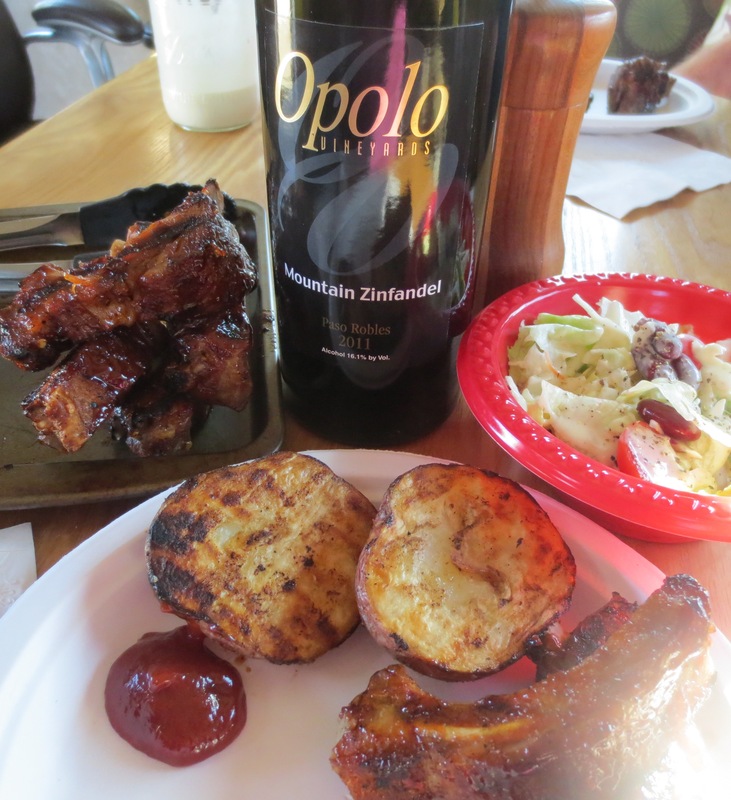 “Trailer Trash Dining”… Spareribs with Blues Hog BBQ sauce, grilled potatoes AND we found a bottle of Opolo wine in a local wine shop!! (in Tennessee). Dessert, I’ve been combining ~6 oz. 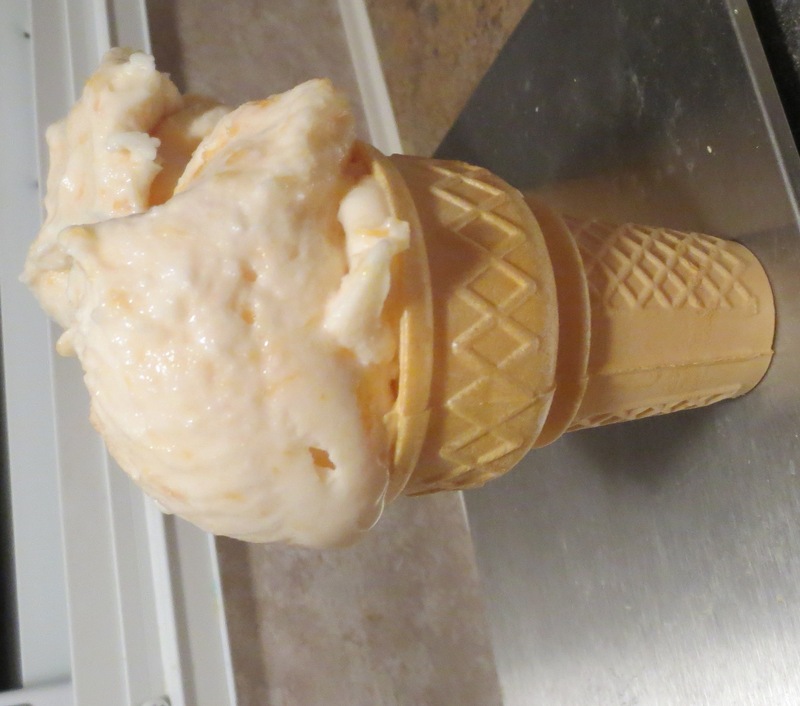 of frozen yogurt with different jams/jellies/sauces and last night was peach jam – so good. And we can have a different flavor everyday. 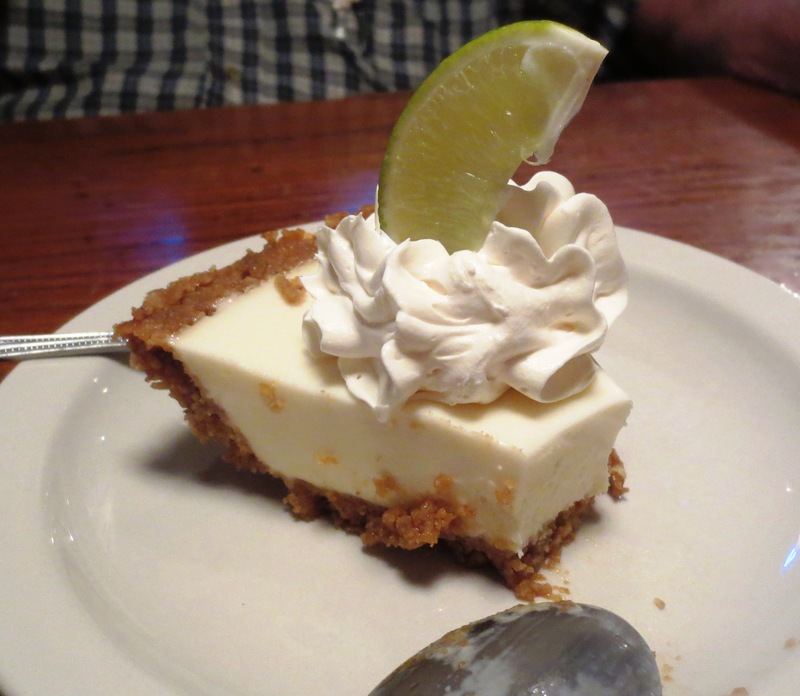 And today, Nov. 4th – we had an old family favorite, albeit adapted to what I had on hand. 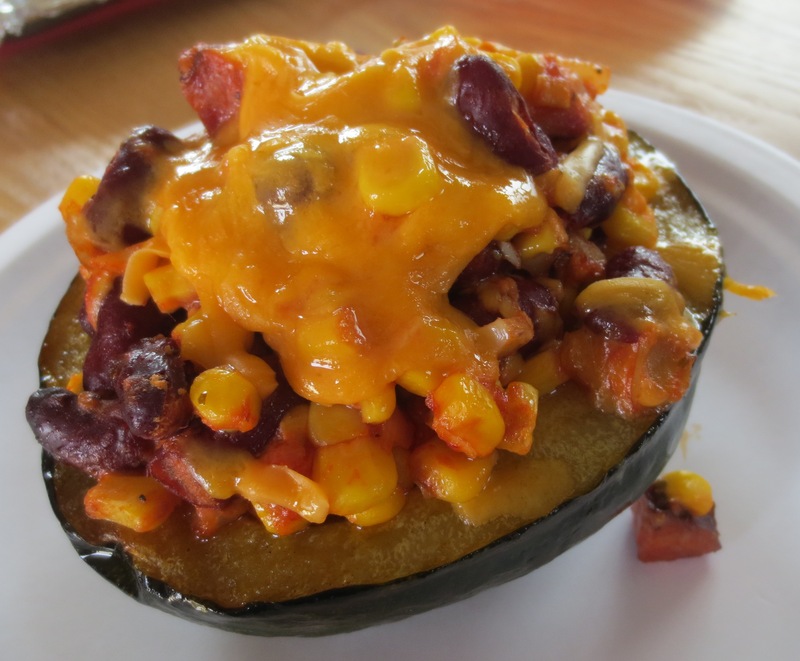 Stuffed Acorn Squash – slight take-off of my Black Bean & Corn cookbook recipe – using Andouille Sausage, Kidney beans, and jalapeno for the ground beef, black beans, and Tabasco. If you happen to have a Cab on hand, the dish was very good with it. Line a 13×10-inch baking pan with foil; lightly grease the foil or spray with cooking spray. Cut squash in half lengthwise and scoop out seeds and cut a thin slice off the bottom of each half so they sit flat. Place squash, cut side down, on the foil. Bake for 30 minutes; remove from oven and turn the squash over and continue baking for approximately 20 minutes or until tender when pierced with a knife. While the squash bake, cook the beef, onion and garlic until beef is no longer pink; add bell pepper and cook, stirring, for 2 minutes longer. Stir in all remaining ingredients except cheese and set aside or refrigerate until it’s time to stuff the squash. Divide the mixture between the halves of the squash and put back on baking sheet. Bake for about 20 minutes, until hot. Add cheese and continue baking for a few minutes longer, or until cheese is melted. 4 servings. 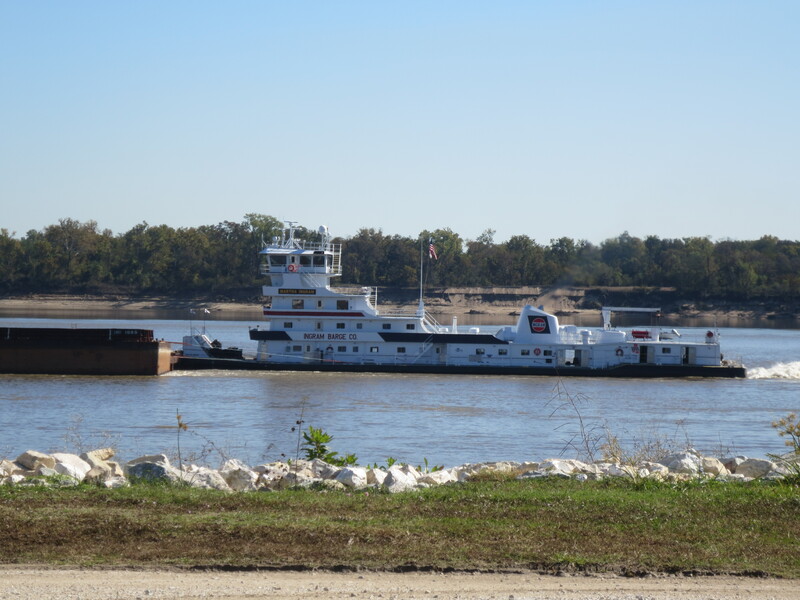 Our time is just about up for enjoying the barge traffic on the Mississippi River – tomorrow we leave for Vicksburg, Mississippi and we going to try (weather permitting) to follow the Mississippi south as long as possible. 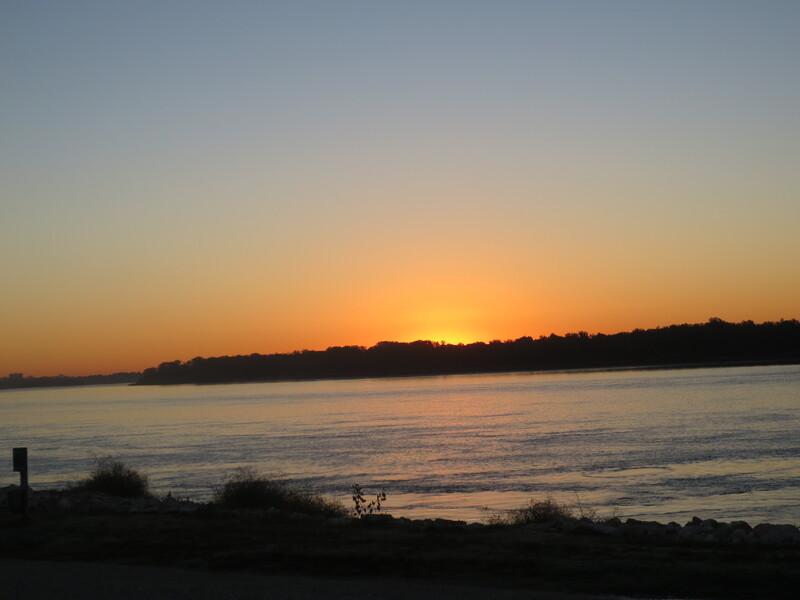 And one last recipe to try in Arkansas – a packaged creation. Tony Chachere’s Famous Creole Cuisine…Red Beans & Rice Dinner mix. Don’t know how many years it has been since I’ve purchased something like this, but I dearly love Tony’s Creole seasoning (which I still can’t find! in local shops), so I’m going for it. If it works, I will share with you all. What a gorgeous area – and, I’m sure we’ll be back.